The reasons for me to visit Windward Mall have admittedly dwindled over the past few years. First, the Borders store closed last year; then the Suncoast Video store followed suit earlier this year. Earlier this month, we learned that the Marukai Discount store there will be shutting down as well. That pretty much leaves Ben & Jerry's, Ono Cheese Steak, the theaters and a GameStop ... and it would take something reeeeeaaally good going on at one of those to convince me to make my way out there. Or, of course, you could just put on an Anime Day, like the one that Kawaii Kon is hosting on Sunday. A mini dealers room/Artist Alley will feature stuff for sale from idkwhat2wear and steampunk accessories from Mad House Mind Works, among others. A stamp rally with select Windward Mall merchants will give you the opportunity to win special prizes, including a three-day pass to Kawaii Kon 2013. Local artist group MangaBento will be hosting a photo booth with props to help you look like you're in a living manga panel. The other local artist group, Pen & Ink Works, will be offering a "make your own manga" activity as well as drawing contests throughout the day. Comic Jam Hawaii will have artists collaborating on cartoons from 10 a.m. to noon. The Hawaii Video Gaming League will be hosting a Tetris tournament. Also on stage: "Cosplay Runway," a showcase of several talented cosplayers in these fair islands of ours. Kaneohe Library will be showcasing some of the anime and manga available to borrow there. Add to that an anime theater where you can watch a few series and games to play throughout the day, and you have a whole bunch of activities guaranteed to please any anime fan and regular Kawaii Kon attendee. Special rates for con passes will be available, too. It's all happening from 10 a.m. to 3 p.m. at the mall, at 46-056 Kamehameha Highway in Kaneohe. Cacy & Kiara on tour: Author/Aiea Intermediate art teacher/MidWeek cartoonist/friend of the blog Roy Chang will be promoting his book Saturday on the Perry & Price Show live from Jade Dynasty Seafood Restaurant. Your friendly neighborhood blogger confesses that he had no idea that Perry & Price moved to Jade Dynasty, having last listened to their live show regularly back when it was in the Hanohano Room, 30 stories above the beach in the Sheraton Waikiki, then noting their subsequent moves to John Dominis and Jimmy Buffett's in Waikiki. But I digress. No word on exactly when in the show Roy will be on, so you'll just have to listen to the show on KSSK 590 AM or 92.3 FM between 8 and 11 a.m. and hope for the best. Comic Jam Hawaii: This group of collaborative cartoon artists is going to be everywhere this weekend. Anime Day aside, they're also going to be at Liliha Library (1515 Liliha St.) from 1 to 4 p.m. Saturday, and they're going to be holding down their regular slot in front of Hot Unique Imaging, on the Uptown side of Pearlridge Center, from 1 to 4 p.m. Sunday. My hand would be falling off after just an hour of drawing, if not sooner, so I really have to give props to the artists who end up showing up at all three events. Visit www.facebook.com/groups/147779161986428 (Facebook login required). Hello Kitty designer visits: Swing by Shirokiya at Ala Moana between 10 a.m. and 5 p.m. today through Sunday, and you can meet, and get an autograph from, lead Hello Kitty designer Yuko Yamaguchi. Take pictures with Hello Kitty, learn how to make cute lunchboxes, get a cute character manicure and just bask in the glory of super-sugary Sanrio CUTE. Be one of the first 50 people in line each day, and you could even get a $5 gift card for Hello Kitty beauty products at Sephora. idkwhat2wear: Terri Dux, Karl Miyashiro and the gang are sitting out this weekend's batch of craft fairs. (So are nemu*nemu's Audra Furuichi and Scott Yoshinaga.) But they'll be back in action Tuesday at Wabi Sabi's Christmas in Honolulu Craft Fair from 5 to 8:30 p.m. at the Japanese Cultural Center of Hawaii, 2454 S. Beretania St., in the fifth floor ballroom. Adopt a "musubi angel," and you can get in early at 4 p.m. I honestly thought I wouldn't be able to contribute to this month's Manga Movable Feast, hosted by Matt Blind over at Rocket Bomber. It was the same problem that doomed my participation in last month's MMF: too much stuff to deal with in life outside of Otaku Ohana, not enough time to sit down and commit some thoughts to pixels. Last month, it was the ramp-up to the general election that kept me busy. This month? It was preparing for that garage sale with tag-team partner in fandom Wilma J. that I noted in my last post. So I was pleasantly surprised to fire up Haruhi after the sale was over on Sunday -- yes, if you remember a post from aaaaaallllll the way back in 2009, my home computer is still named Haruhi and my laptop is still named Yuki, although my iPad has inherited the name "Mikuru" -- and find that Matt had delayed his wrap-up post for this month's MMF to today and tweeted his intent to still accept links for it. And then that wrap-up post went up while I was working on the post this morning. But dagnabbit, I'd already written 700+ words at that point. I wasn't abandoning this post that easily. Besides, this month's topic is so intriguing: Rather than focusing on a single title, author or genre as it has in the past, the bloggerati were asked to take inventory of their manga blessings in this, the season of camping out in line for five days to buy a $199 50-inch flat-screen TV giving thanks. Check out his call for participation to see the inspirations we were given. I meditated for a little while on what I've been thankful for in the world of manga. Those meditations, however, kept getting interrupted by thoughts about this one particular young woman who showed up toward the beginning of our sale. She was excited to be there. Virtually bouncing up and down. She dropped a bunch of money on a replica animation cel of Hitsugaya from Bleach, a few more dollars on Ranma 1/2 wall scrolls and an old Inu-Yasha bag and other stuff, then she came back with her friend and ended up buying a Vampire Knight journal and a pack of Bleach cards. Incredibly enthusiastic about the stuff she was buying, for certain. Heck, she even showed me a few volumes of Kare Kano -- already tucked into said Inu-Yasha bag -- that she had checked out from the library. I love seeing fans like that. Reminds me of the enthusiasm I had when I first really got into manga in the late '90s. Sure, I'm older now. Saw the rise and fall of Tokyopop and a bunch of other publishers, had several favorite series canceled on me before they were finished (hello, Nodame Cantabile and Moyashimon, may you return to our shores someday), looked on as publishers' bottom lines have been ravaged by scanlation sites all over the Internet and the Borders shutdown. I'd be lying if I said all of this, plus the constant harping about problems with this publisher and that publisher and the publisher over there and so forth and so on, hasn't dampened my spirits over the years. All things considered, though? I'm thankful that the manga publishers that remain in the domestic market continue to believe that there are those enthusiastic fans out there. And that those publishers keep bringing over new series that they hope will garner the same amount of enthusiasm on the market as there was when the negotiations to license those series took place. There's always that little thrill I feel whenever a convention rolls around, and a news item pops up on Twitter or Anime News Network or somewhere that "Publisher A has licensed this, this and this," and there's something in that list that sounds interesting enough for me to give it a shot when it finally shows up. And that publishers are willing to try new ways of getting manga out to the masses -- I really want JManga's digital-distribution model to succeed. I want publishers like Viz, Yen Press and Dark Horse to do well with their digital initiatives. I'm hoping that Digital Manga Publishing's temporary suspension of print publication doesn't end up hurting them in the long run, because they've seemed willing to try new things, like using Kickstarter for niche Tezuka titles to complement their print and digital offerings. But above all, I'm thankful for the eternal hope of second chances. When you've seen as much manga as I have over the years, and when you've seen some of the really good series eventually start to fade out of print, it's really nice to know that there are people making decisions for those publishers who think, "You know, that series did well for someone else, but it's no longer around for whatever reason, so let's bring it back." JManga has a bunch of niche titles from the days of Aurora, Del Rey, Go!Comi and other such publishers that don't exist in those forms today. Kodansha's redoing Sailor Moon and Love Hina. Much of CLAMP's body of work is seeing new life in Dark Horse omnibus volumes. Blood Alone and Gunslinger Girl sailed back with Seven Seas. Viz has 07-Ghost and Loveless. Vertical brought Paradise Kiss and Message to Adolf back into print. I mean, Message to Adolf! We hadn't seen an English translation of that in more than 15 years, and those Cadence-published books were long out of print and nigh impossible to find! It keeps hope alive that a new group of fans can enjoy in the present what we long-time fans may have enjoyed in the past. While this post has focused primarily on manga, keep in mind that what I've written applies to the anime industry as well. Recently, I received in the mail from Funimation the review DVDs for their reissued edition of Serial Experiments Lain. Lain, believe it or not, was the first anime I ever watched that I recognized formally as anime all the way back in 2000. Here's the profile that I wrote about it in 2009. Seeing those discs in the envelope gave me a bit of a thrill. Maybe I'll watch those again sometime when I have free time (which, as I've probably said before, has been distressingly sparse of late, but I'll try). The joys of being an anime and manga fan. That's what I'm thankful for, too. Your tag-team partners in fandom, Wilma J. and I, are currently going crazy over preparing for a garage sale on Sunday. Professional decorum dictates that I not directly link to it here, but if you're here on Oahu and want to come, run a search on "anime mililani garage" on Craigslist, and you'll find all the info there. idkwhat2wear: Terri Dux, Karl Miyashiro and the gang will have an assortment of pins and apparel available. Stacey Hayashi and the Journey of Heroes graphic novel: This is the last fair that Stacey is scheduled to be at this year, so you'll want to take advantage of this opportunity to pick up this manga-style book chronicling the achievements of the 442nd Regimental Combat Team/100th Infantry Battalion in World War II if you haven't already. Joining her to sign books for a little while will be Eddie Yamasaki, 442nd Regimental Combat Team item chapter president. By the way, if you recall a few weeks ago, I promised I'd post a picture of Stacey's chibi Christmas tree from the Noelani craft fair; there it is, to the right. The Hawaii Okinawa Center is located at 94-587 Ukee St.; parking is interspersed throughout the surrounding neighborhood. Oh, and bring a canned good for the Hawaii Foodbank, too; you'll get a free, yummy andagi for your donation. If you'd prefer to stay in town -- and have a supreme amount of patience/tolerance for crowds, because really, the number of people who converge on the Blaisdell Exhibition Hall for this event every year is insane -- idkwhat2wear has a split squad and will have a booth at the Islandwide Christmas Craft & Food Expo. Look for them in booth 149 today from 10 a.m. to 9 p.m. and Sunday from 10 a.m. to 5 p.m. Welcome to the Cel Shaded Report's "staycation edition," in which your friendly neighborhood blogger, having spent most of his recent time and energy cleaning up and reorganizing his anime, manga and magazine shelves during a vacation that ultimately will have spanned 10 days by the time it wraps up on Saturday, sees a few events that are happening this weekend, does a quick writeup on them, posts them for everyone to see, then gets down to the real order of business: writing the first non-Manga Movable Feast-related review that I've written in this space in months. Comic Jam Hawaii: ... this group of local artists is gathering to draw collaborative cartoons and other artwork and talk story for a special post-Cacy talk Jam at the library at 2 p.m. Saturday. Or, if you prefer, come to their meeting from 1 to 4 p.m. Sunday at Pearlridge Center, on the Uptown side of the mall, in front of Hot Unique Imaging. Artists of all skill levels are welcomed. Visit www.facebook.com/groups/147779161986428 (Facebook login required). nemu*nemu: Scott Yoshinaga and Audra Furuichi will be bringing their plush pups, prints, pins and other cool swag to the St. Andrew's Priory Holiday Fair at the school, 224 Queen Emma Square downtown, from 9 a.m. to 2 p.m. Saturday. (Look for them in the gym.) Visit www.nemu-nemu.com for a complete list of events they'll be exhibiting at during this craft fair season (and check out their current story arc, a tribute to the Peanuts strips of yore). idkwhat2wear: Hey, Hilo, it's your turn this weekend to get a crack at the pins and apparel sold by Terri Dux, Karl Miyashiro and the gang ... and I understand they'll be debuting a never-before-seen T-shirt design, at that. Look for them at the 25th annual Christmas Craft "EG"stravaganza at Edith Kanakaole Multipurpose Stadium in Hilo from 5 to 10 p.m. today and 9 a.m. to 3 p.m. Saturday. Admission is $2 for ages 12 and up. Visit www.idkwhat2wear.com for a complete list of their events this craft fair season. Craft fair season also means it's prime time for several friends of the blog: Audra Furuichi and Scott Yoshinaga of Kimonokitsy Studios, Team nemu*nemu's plush pup purveyors; and Terri Dux, Karl Miyashiro and the rest of the idkwhat2wear gang, supplying buttons for my office/building security card lanyard for ... umm ... a bunch of years now, I just know it's been a really long time. They'll be hitting a bunch of fairs over the next few weeks, and this post marks the official start of the Otaku Ohana/Cel Shaded Report tracker of where exactly everyone will be. The five-star event of this weekend has to be the 23rd annual Noelani Elementary School Craft and Children's Fair from 9 a.m. to 2 p.m. Saturday, where nemu*nemu and idk will both be in attendance. The Noelani event also marks the formal, buy-them-and-take-them-home-the-same-day debut of the new plush pup quartet of Blue, Enchilada and LOLPup variants of Anpan and Nemu. Audra was kind enough to drop off some samples to the office, and ... well, LOL Anpan and Nemu ran off to go talk to the editors in the Today section about possible coverage in print that could show up in the next few weeks, while Blue and Enchilada got some valuable on-the-job training about paper clip organization from old-school Anpan and Nemu. There's one other Noelani exhibitor worth pointing out, but that deserves its own section of the Cel Shaded Report in a little bit. For now, I'll say that you can find Audra and Scott and idk in the cafeteria. The school is at 2655 Woodlawn Drive in Manoa. Bring the kids and make it a family fun day, too -- this event certainly looks promising on that front. Can't make it? The idk gang will have a quick turnaround, making an appearance at the Diamond Head Arts & Crafts Fair at Kapiolani Community College from 9 a.m. to 2 p.m. Sunday. (KCC is at 4303 Diamond Head Road; look for them on the Makapuu Avenue side of the campus.) Audra and Scott's next appearance will be at the Priory Holiday Fair at St. Andrew's Priory (224 Queen Emma Square, downtown) from 9 a.m. to 2 p.m. Nov. 17. And if you can't make that, keep checking the Cel Shaded Report throughout the season for weekly updates. So about that other exhibitor I mentioned earlier. Also appearing at the Noelani craft fair will be the newest friend of the blog: Stacey Hayashi, author of the Journey of Heroes graphic novel that recently was covered in this space. She'll have a stack of books and other chibi goodies on sale, as well as a "chibi Christmas tree" on display that I promise to post a picture of if I succeed in finding a decent parking space for this event. (Yes, this is my formal declaration that I'm actually going to attempt a visit. Wish me luck.) 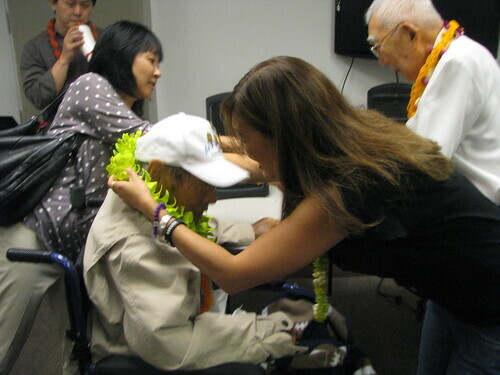 Joining her to sign books will be Eddie Yamasaki, 442nd Regimental Combat Team item chapter president. If you can't make it to that event, Stacey and several World War II 442nd Regimental Combat Team/100th Infantry Battalion veterans will also be observing this extended Veterans Day weekend with a second book sale/signing, this one at the U.S. Army Museum of Hawaii (2131 Kalia Road) at 10:30 a.m. Monday. For the latest updates on all things related to Journey of Heroes, visit www.facebook.com/442comicbook or www.442comicbook.com. This update also comes with a bit of sad news. If you looked at the Journey of Heroes reception gallery featured in this space a few weeks ago, you may recall this picture of Stacey with 100th Infantry Battalion veteran Goro Sumida. Goro was Stacey's "original chibi," the man whose stories formed much of the foundation of her book. Sadly, a few weeks after this photo was taken, on Oct. 25, Goro died at the age of 92. Here's his obituary. My thoughts and prayers go out to the family. Friends of the Library of Hawaii: It's a savings countdown this weekend at the Friends' Harbor Warehouse in Kakaako, with a wide selection of books available for $3 from 9 a.m. to 4 p.m. Saturday, then marked down to $2 from 9 a.m. to 4 p.m. Sunday and finally $1 from 9 a.m. to 3 p.m. Monday. If past experience at these sales holds, the chances are pretty high that you'll come upon some used manga (both translated and untranslated) during your treasure hunt. The warehouse is located ewa (west) of the UH medical school; just go makai (south) on either Forrest Avenue or Keawe Street to the end, and you'll be there. Visit www.friendsofthelibraryofhawaii.org. MangaBento: This group of anime- and manga-inspired artists will be meeting from 1 to 4 p.m. Sunday at the Honolulu Museum of Art School (1111 Victoria St., Room 200) ... but it will not, repeat, not be a typical group meeting. Instead, the group is presenting a workshop on coloring techniques using computers. Bring your laptops and tablets. Cost is $10; no preregistration necessary. Visit www.manga-bento.com.